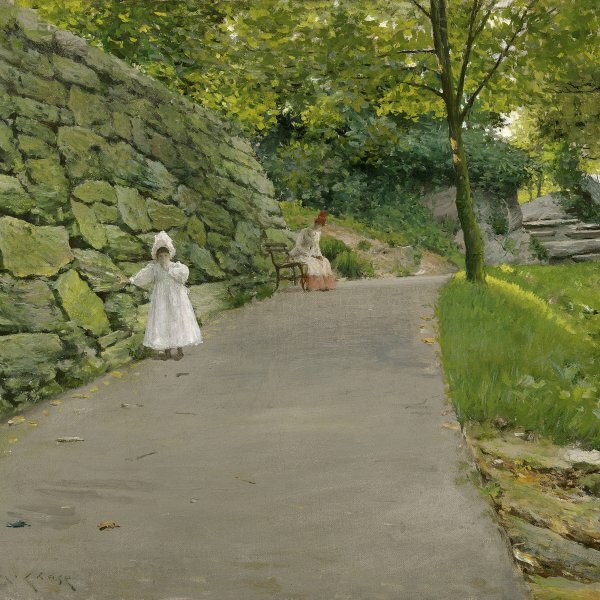 William Merritt Chase shared the vogue for “japonisme” in European art and from the 1880s onwards began to include references to that culture in his own work. 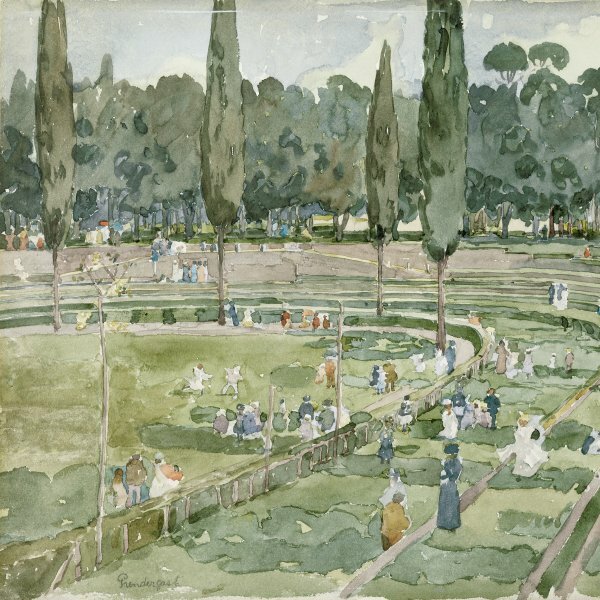 In addition to his activities as a collector of Oriental objects, he was also influenced by James Abbott McNeill Whistler who acted as a connecting link with Europe for American artists and with whom Chase spent the summer of 1885 in London. When devising his compositions Chase repeatedly made use of objects such as the screen, kimono and magazine stand that can be seen here. The present painting is notably similar to Caprice in Purple and Gold no. 2: The Golden Screen that Whistler had painted more than twenty years earlier and which was known to many artists from reproductions in books and periodicals. After the opening-up of Japan and the expansion of trade routes in the mid-nineteenth century, Japonisme immediately spread across Europe and America. 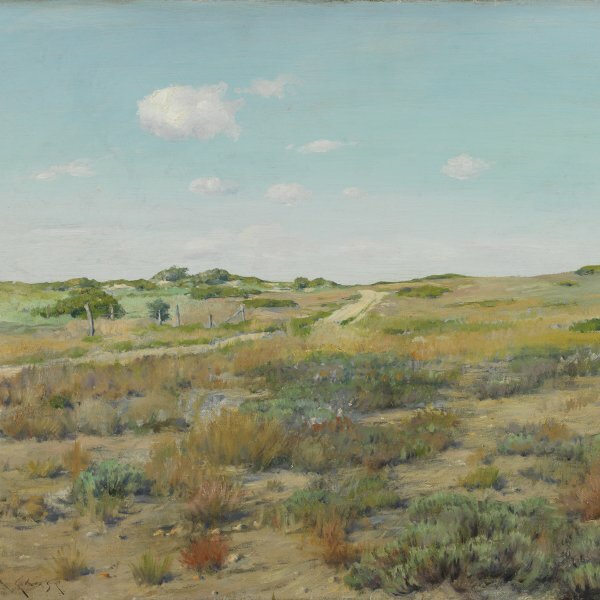 Just as the paintings of the Paris Impressionists adopted certain compositional features of Japanese engravings and elements of Oriental styles, William Merritt Chase felt similarly attracted by everything Oriental. In the 1880s the American painter produced a series of “kimono portraits” of a few relatives and friends including A Girl in Japanese Gown in the Museo Thyssen-Bornemisza collection. The artist’s newfound enthusiasm for Oriental styles is closely linked to the influence of the Japanese-inspired paintings of James Whistler, who also professed a great attraction for Oriental textiles, designs and objects. Chase had met Whistler in London in summer 1885 and the two had immediately taken a liking to each other. The artists painted each other’s portrait, and Chase soon began to display his compatriot’s influence in his female portraits. In her study on the Thyssen-Bornemisza A Girl in Japanese Gown, Kathleen Pyne links it to Whistler’s Caprice in Purple and Gold: The Golden Screen in which a girl dressed in an elegant kimono poses seated before a screen viewing a set of Japanese prints, no doubt the series of the Famous Views of the Sixty-Odd Provinces by Hiroshige, the Japanese artist who most greatly influenced Whistler. 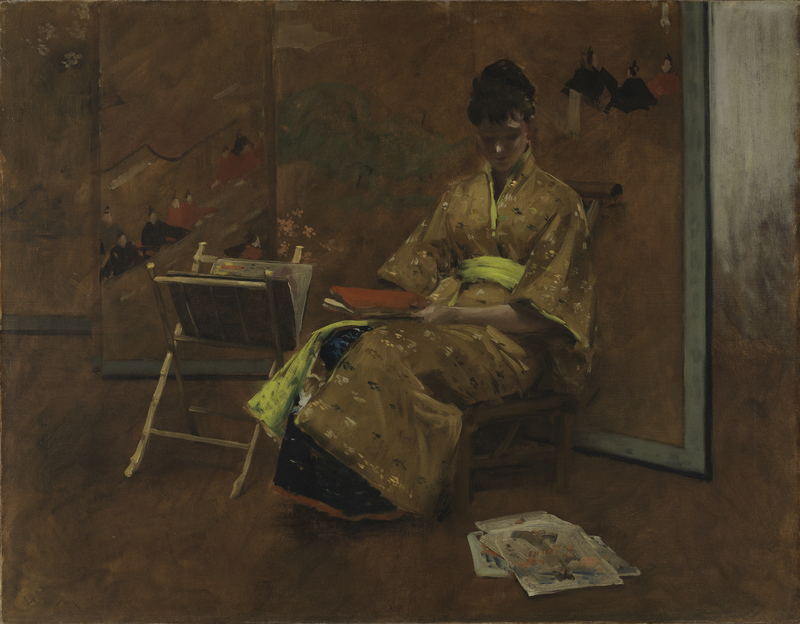 The female figure in Chase’s work is not only clad in the silk kimono that gives the painting its title but is seated on a low bamboo chair before an Oriental screen and studies a series of sheets with Japanese drawings, like the young woman in Whistler’s painting. Furthermore, the ascending perspective and the asymmetry of the composition display the same influence but can also be related to another essential influence in Chase’s oeuvre, photography. In other respects, the concern Chase shows here for creating a mysterious, contemplative atmosphere and for modulating light, together with the loose brushwork, deserve him the title of pioneer of American Impressionism.